Web giant Google has unveiled new products that it says will push search in a new direction. Google is using so-called semantic web technology to leverage the underlying data on websites to enhance results. "The race in search is far from over and innovation and continued improvement is absolutely pivotal," said Google's Marissa Mayer. Google said it could not afford to rest on its laurels in the quest to build the perfect search engine. Google has over 63% of the US market compared with rival Yahoo, on 20%. "I've said this many times but search is still in its infancy. Our engineers are worried about what is the next big thing in search and how are they going to find it," said Ms Mayer, who is the vice-president of search products and user experience. She said that last year Google had released more than 360 products and in the first quarter of this year it had been 120. Ms Mayer added that this was proof that "Google gets better all the time". Google has in the past said that despite its lead in the marketplace, users were "one click away" from switching to other alternatives. Vanessa Fox of SearchEngineLand told the BBC that Google's ability to constantly innovate gave them a leading edge. "Google is saying: 'We have to provide for all searchers and do things at scale.' It means they have to launch all sorts of features while some companies can concentrate on just one thing. The key thing behind why they are still ahead is because they are able to innovate at such a pace," said Ms Fox. During the Searchology event at Google's Mountain View headquarters, Ms Mayer and her team showcased four new products that she said would give users a "different way to look at the web". Rich Snippets are search results that return more information in every listing. For example, users looking for reviews of a new restaurant might get a "rich snippet" of average review scores, number of reviews and the restaurant's price range. "This is a step toward making the whole internet smarter," said Google product manager Kavi Goel. Rich snippets use the metadata from web pages, such as address information, calendar information and semantic web mark-up specifications, called Resource Description Frameworks. The use of these so-called microformats allows the search engine to better understand the meaning of data and to employ it more intelligently. Google can understand the relationship between different sets of data, and so can pull the correct address listing of a shop without that information having to be specifically tied together. One of the more experimental products was called Google Squared, which will go public in the next month or so. It takes information from the web and displays it in a spreadsheet in "split seconds", something Ms Mayer said would normally take someone half a day to do. During the demonstration, a query for "small dog" was typed into the search box. Seconds later a table popped up showing photographs of various dogs, their origin, weight and height in a clear and simple layout. While Ms Mayer described this product as "transformative", she would only hint at the specific techniques that Google uses to drive this feature. "I think we can open the kimono a little bit without talking about the computer science behind it. "What they are basically doing is looking for structures on the web that seem to imply facts. Like something 'is' something. "Different tables, different structures, and then corroborating the evidence around whether or not something is a fact by looking at whether that fact occurs across pages. "This is all in the secret sauce of what we are doing and it takes an incredible amount of compute power to create those squares," said Ms Mayer. 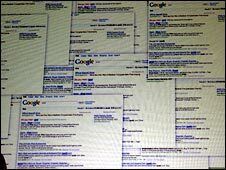 Google Search Options is a tool that is aimed at letting users "slice and dice" results so they can manipulate the information and get what they want faster. They come into play after a normal web search and allow users to drill down into the results by offering an option for different genres like product reviews, forum posts or videos. Other choices include recently added blogs, images, timelines and so on. Ms Mayer said this new feature should help people who struggled with the "vexing" problem of exactly what query they should type into the search box. It is meant to give users the opportunity to "refine, filter and view results in a different way". A final feature had Ms Mayer "reaching for the stars" with an app for mobile phones using the Android operating system. "For a long time here at Google we joked could we actually find physical things like keys and now with the power and technology of Android, coupled with search, you can see we are starting to find some physical things like stars," said Ms Mayer. The feature came about as a result of Google's 20% time, which allows engineers to spend one-fifth of their time working on pet projects. The app is now available on the Android app market. "Clearly Google is still pushing the envelope with all these new additions," said Rob Hof, Silicon Valley editor of Business Week. "They are certainly continuing to improve daily. Whether it makes a difference and will stave off the competition, I don't know. But they are not standing still." Ms Mayer said keeping the user happy was at the heart of everything they did. "There is a shoe company called Stuart Weitzman and their slogan is 'a little obsessed with shoes'. "Google is a little more than obsessed with search," confessed Ms Mayer. When this world has come to an End. . . And The Saviour Of The World. . . Jesus Christ Comes. . . where will all this sites be. . . Google. com, Projectechnics. 8m . net, hxxp: www. myxtremeprofits. com/?id=projectechnics , www. westernunion. com , www. libertyreserve. com , mtnonline . com , yahoo . com and so on be? Who will be in charge of them afterwards. . .
Hope you all fine ! We provide free gps tracking centre system service . This is Wendy from Oner Electronics Technology Limited. We are an announced company in manufacturing and trading GSM/GPRS/SMS tracking systems, fleet tracking, truck, container, motorbike tracking, personal security, Home alarm. check distance and so on. If you have interesting ,pls reply email to me ! Look forward to do business with your company. Wait your reply soon. Google continously pushing to reduce its cost of doing business online and that's what makes them unique and powerful. "The winner ain't the one with the fastest car its the one who refuses to lose. " Really grateful post, I read it entire and learn lot of new thanks that are very essential for me so thanks for share great info with me . . . . . . . . . . . . .
google has been the all time favourite search engine which goes on improving and transfering itself to some Great one. . .
hmm. . goole going realy wild. . . .
yeah, Google still being the best search engine, but we must be aware that Google is work as spying tools for USA and allies. Take care of this. .